Jax is a young and rare Guadalupe fur seal under our care. Jax, H.M.S. Pinnifur, and Rascal are now back in the ocean today! With help from our friends at the Channel Islands Marine & Wildlife institute, the Guadalupe fur seals were loaded onto a boat called the Condor Express and released at the Channel Islands in Southern California. The islands are a wonderful breeding ground for fur seals - so it was wonderful to release them back into familiar waters! Jax, Rascal, and H.M.S. Pinnifur were all released from a boat near the Channel Islands. NOAA Permit No. 932-1905. Jax is currently doing well and eating on her own! She still needs time to gain weight and strength, but at least she has a new campion. Our friends at the Northcoast Marine Mammal Center sent Rascal, a male Guadalupe fur seal, to us to keep her company. 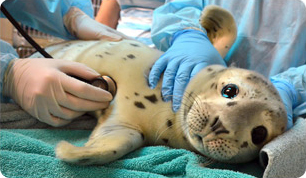 We have a rare pinniped patient at our hospital this Earth Day week! Jax is a Guadalupe fur seal rescued from Oceano Dunes Vehicular Park in San Luis Obispo County by our Morro Bay-based volunteers after they received a call about her being in an unsafe location and looking very emaciated. This is a state park that allows vehicles onto the beach and, unfortunately for Jax, she was too weak to dodge vehicles, people and dogs, so an immediate rescue was necessary. At only 8.5 kilograms (barely 19 pounds), and just 78 cm (31 inches) long upon rescue, Jax is considered small for her age. Her condition was so bad that she was displaying "less-than-normal" hair growth and density. This means that Jax's fur is thinner and shorter than it should be. Veterinarians even found small barnacles attached and growing in her hair. Too sick and weak to take care of herself, Jax also appeared to be somewhat uncoordinated in the water of her pool at our hospital. In the wild, you would expect to see her vigorously groom herself while swimming around. Like otters, fur seals get most of their insulation from their thick, oily fur, not blubber, so grooming is a critical part of their daily lives. Given Jax's overall compromised condition, she was in danger of secondary infections, such as pneumonia. Based on her blood work and other on-site lab tests, staff veterinarians prescribed a supportive care protocol that included antibiotics. Because she was too weak to eat on her own, animal care staff and volunteers provided her with liquid nourishment by way of tube feedings. Within recent days, she has been weaned off of the "fish milkshakes" and is now eating fish whole without assistance. She's also grooming herself; all of these behaviors are good signs that she is starting to recover! It is quite rare for us to have Guadalupe fur seals at our hospital, mostly because these are animals that primarily live and forage offshore, unlike their coastline-hugging relatives like California sea lions. Matter of fact, Jax is only the 49th Guadalupe fur seal to be under our care since 1975! Find out why "The Beard" is here! Buy some meals for our seals by April 30 and be entered into a drawing to attend a bon voyage for Al Catraz the sea lion! - Dollar-a-Pound!